I love travel related books and once I missed an offsite to Turkey. This enchanting country has managed to embrace the old and new, its baazars in snaking lanes and bylanes co-exist with modern structures and air-conditioned malls, people are broadminded and yet value their ancient heritage. The next best thing to actually traveling to Turkey was to pick up this book and see it through Rachael's eyes. The book description gripped me: "When she doesn’t get a place in a Mexican study abroad program, U. S based Rachel anticipates another summer behind the counter of a coffee shop until an unexpected opportunity to spend a month with a family in Turkey drastically changes the course of her summer. This intercultural coming-of-age novel is full of exotic tastes, summer heat, promises, and love. In a summer village on the western coast of Turkey, you’ll meet Rachel, who doesn’t know what she wants; Aylin, who doesn’t know if she wants the one who wants her; and Leyla, who knows who she wants, but doesn’t know if she’ll get him. 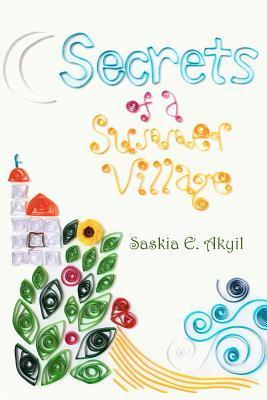 Love and romance are secret pleasures in the summer village, which only make them more exciting. Can coffee grounds tell your future? Will fate bring you to your soul mate thousands of miles from home? Would the evil eye dare stop two souls on their paths to each other? Travel with Rachel on her journey far from the comforts of home, to a place that will captivate her and leave her changed forever." Another aspect that immediately caught my eye was the beautiful cover. With the book in my hand, I now realise that it is a quill design. It provided just the right touch for a book that is as refreshing to read as the sea breeze on a summer day. My views: This book is so descriptive that I could actually feel the warmth of the Turkish host family, smell the salty sea breeze of the Aagean sea, hear the laughter of Rachel and her host sister Aylin and their family and friends and my taste buds tingled whenever the family had their delicious meals together. Typically, nations where the majority of the population comprises of Muslims gets typecast as Arab nations. This was brought out in the book. In fact, when Rachel was offered the opportunity to visit Turkey on a student exchange program, she even wondered whether she would have to wear a veil and her mother wondered whether in this 'Middle Eastern' country, a young American girl would even be allowed to step out. Fortunately, the school counsellor and a lot of googling and reliance on good old Wikipedia and of course the Atlas (Turkey is near Greece) sorted out these misconceptions. The emails from the host sister, saying that she watches American TV serials and "We wear clothes much the same as you", further helped matters. Did you know the Turkish language uses English alphabets, I didn't till I read this book. Yes, there was a freedom to wear what you wanted, except that while Rachel at home lounged about in track pants and sweat shirts, in Turkey, these clothes would only ensure that you looked unkempt! Rachel learnt a lot more than just learning how to wear make-up. During her stay, Leyla, the elder sister in the host family had to get married in a rush, because her fiancee had to take up a job in Japan. Unlike the US the marriage was a huge affair with personal invitations (and not postal) to be sent to friends and relatives. The henna ceremony was so different from the bridal showers witnessed in most parts of the Western world, which is being increasingly adopted across the world. Rachel learnt much more than just Turkish culture, she learnt about true friendship, how to make the right decisions (a value her father had instilled in her) and also experienced love for the first time (which hopefully will lead to a lasting relationship, at least the reading of the coffee beans predict this). It is an amazing read. I love travel books and reading about other cultures and the author has portrayed the Turkish culture so well. Perhaps this is because having married a Turk, she knows this culture and the warmth that Turkish families share. As an added bonanza to an excellent story, each chapter began with a Rumi prose, which gels well with the content of each chapter. I reached out to Saskia E. Akyil with a few questions. What was the inspiration behind the book? My husband, who is Turkish, has a habit of repeatedly telling me the stories of his youth, particularly the ones from his summer village community. When we visit Turkey now, we usually spend a lot of time at this same summer village. I thought it would be a great subject for a young adult book. I envisioned readers going on a mental vacation to a summer village and adolescence, where you don't have too much to worry about. I began writing the book when I was caring for my two-year-old and a newborn sons, and my parents were divorcing. I needed an escape where I had few responsibilities, and writing this book became that escape. Even though the book is officially classified as a young adult book, just as many adults as young adults have enjoyed it. Turkey is a unique destination, why did you choose this as the setting in the book? As I've already mentioned, my husband is from Turkey and we spend a lot of holiday time there. But that's not the only reason. Turkey barely exists in the imaginations of Americans and many others, and yet it is the home of many ancient cultures, and modern Turkey grew out of the great, powerful Ottoman Empire. Turkish culture is a mix of many cultures - Turkic tribes originally came from central Asia, they eventually embraced Islam, and also mixed with Europeans in Anatolia. Anatolia, the land that is now Turkey, is the historic home of many great cultures including Assyrians, Hittites, and ancient Greeks. The earliest historical records from the area date back to the 24th century BC. The area has a history of change, as does Turkish culture and Turkish people, and Turkey is currently going through massive cultural changes again. And yet what do Americans know of Turkish culture? What do Indians know of Turkish culture? Very little. Much of the dialogue we hear regarding Turkey now is about whether or not there was an Armenian genocide. Whether or not Turkey should be accepted into the E.U.. Whether or not women should be allowed to wear headscarves at school. There is plenty written about those topics. I wanted to write something that was not about any of that. I wanted to write about the Turkey that I experienced. I'm currently working on an audiobook of Secrets of a Summer Village, which will hopefully be available on Audible once it's done. I'm also working on a sequel, as well as a completely different book, the topic of which is still enough up in the air that I can't really summarize it yet. Thank you Saskia for the book and for the interview. Source of the photograph: Whirling Dervish available on a Flickr site under the Creative Common License. 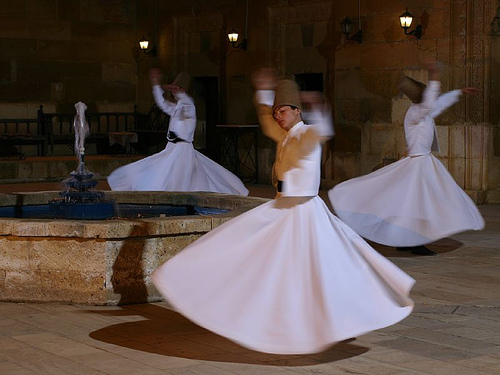 You can also watch this dance of worship performed by Whirling Dervish on YouTube:The ritual of the Mevlevi sect, known as the Sema, is a serious religious ritual performed in a prayer trance to Allah. Turkey has always seemed exotic to me. What struck me as I read your book review is we are human beings finding our way. We may have different rituals but in the end we all want pretty much the same thing; family, home and a happy life. @Susan: Yes, we are not different after all. Excellent post, you made me want to read the book. I have always wanted to do what the main character does: spend a month (or more) with a family for a country other than my own. There's nothing like learning a new culture by actually living with the people there. Good that you make an effort to make people all over the world read books describing cultures different from their own. Already knew about what's written in the books. Can't help adding that the Turks, from Central Asia, eventually managed to conquer Istanbul and end the Eastern Roman empire. The Arabs had tried, and failed for years. That book sounds well worth the read so I guess I'll have to add another one to my Amazon wishlist. I visited Turkey two years ago and found it lovely beyond all compare, so it will be nice to get lost in a book that can bring all the sights and sounds of that country to life. After reading your review, I have a desire to read this one. May be available at my library. Great review Lubna. What intrigues me about Turkey is that it literally is the intersection between European & Middle Eastern culture. I'm hoping to one day visit Istanbul and see those beautiful mosques there. Lubna, this may have changed my viewpoint of Turkey. I have visited Greece many times and loved it. My only experience in Turkey, however, was Istanbul and it was not a pleasant one. I was traveling with my mother and we found the men in Istanbul to be among the most aggressive and unpleasant in the world. It was the only place that we ever felt unsafe as women traveling alone. So other than some sightseeing in Ephesus, I wrote the country off. This is the first time I have ever understood that Turkey is not a totally Arab country. Perhaps I would have a very different experience in a small village such as the one in this book. This, for me, is just another example of how much I learn from reading blogs that are beyond my usual interests. If it had not been a review from you, I would never have considered reading a book about an adventure in Turkey. Thanks for that! @Bethany: Yes, an experience of living with a local family is the best of all. @Krystle: So glad to meet another Dr Seuss fan! @Jeri: Happy arm chair travelling. This books is enchanting. @Kay: I think men in any 'touristy' place are aggressive. Back home in India, Agra is pathetic. Great book review. Always wanted to travel to Turkey. I had a scuba diving holiday booked there once but had to cancel it last minute due to work. The cover art on this book really grabbed me, too. @Claire: Yes, Turkey is on my bucket list too. @Relyn: I agree. The quilling design on the cover is truly unique.